Self catering, sleeping 4. Free Wi-Fi access. 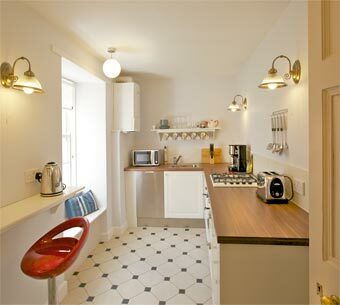 Historic Georgian house rental apartment in central Edinburgh, 2 bedrooms, sleeping 2 to 4. 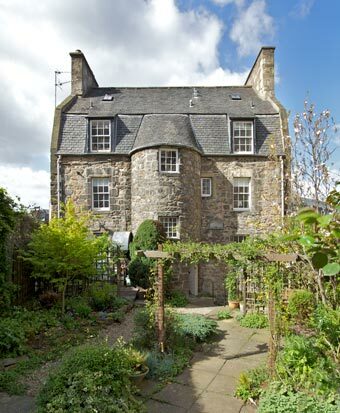 Down a few steps and through a delightful garden is the door to the old stone spiral stairs that leads up to this neat and comfortable first floor flat. Duncan's Land is in a quiet position, and just at the bottom of the street is the "village" of Stockbridge. Here the Sainsbury's Local stays open until 11pm, and there are lots of small interesting shops including the wonderful Mellis artisan cheese shop. Cafés and pubs and restaurants abound. It's a 12 minute walk to Princes Street and a pleasurable 10 minutes back again (downhill!) through some of Edinburgh's finest Georgian streets. If you prefer the bus, Stockbridge has a good, regular service. 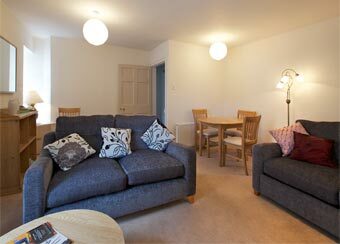 You are welcome to sit out in the shared garden, and there are lovely walks along the Water of Leith nearby. Above left and right; Two views of the Sitting Room and Dining area. 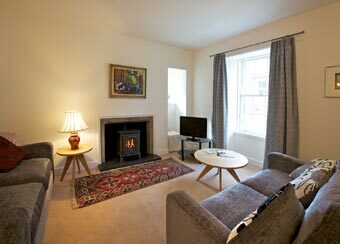 There's a gas fire in the stove, a flat screen TV with freeview channels, and DVD/CD player. Two sofas and a dining table for 4. The windows look over quiet cobbled Gloucester Lane. 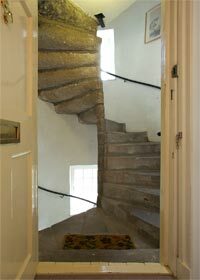 Right; The old (possibly 17th century) stone spiral stairs seen from inside the front door. Left; The bathroom has a bath with shower over, basin and wc. 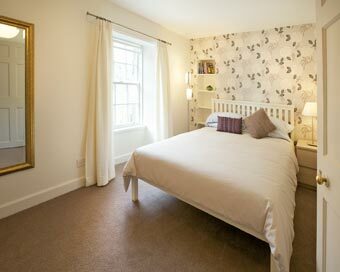 Below left; Twin bedroom with wardrobe. 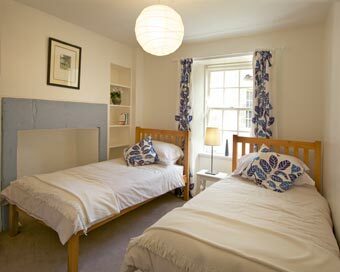 Below right; Double bedroom, with King-size bed and wardrobe. The apartment has central heating throughout. An iron, ironing board and hairdryer are provided. Free Wi-Fi internet broadband for your laptop. 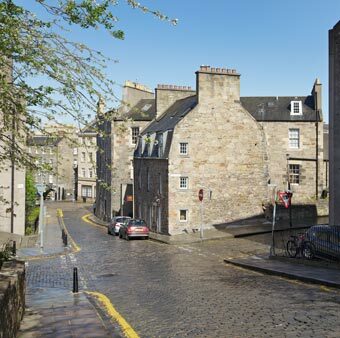 Duncan's Land is unusual in that although it was built in the late 1700's it is made from much earlier materials: salvaged rubble stone from the Old Town renovations just off the Royal Mile. The front door has a lintel saying "Fear God Onlye 1605 IR", IR being Iacobus Rex for King James VI of Scotland, who had become James I of England and Ireland in 1603. The spiral stairs, judging by its construction, may date from that time too. Duncan's land is also notable as being the birthplace of Scottish artist David Roberts in 1796. Raised here with 4 brothers and sisters and apprenticed as a house-painter he went on to become one of Britain's most famous 19th century artists. He travelled widely in Europe and the Middle East, and was the first to illustrate the ancient monuments of Syria, Palestine and Egypt. Visit the National Gallery in Edinburgh to see his work! Electricity, linen and towels are included in the price. A travel cot, high chair, etc., on request. Arrival is after 3pm and departure before 10am. Duncan's Land post code is EH3 6EH. Please tell Morag and Brian you found Duncan's Land apartment through About Scotland! Duncan's Land from Gloucester Lane which leads down to the shops of Stockbridge and the Water of Leith.